Ten shipping containers make up this exciting new mobile art gallery designed and built by Norwegian architecture firm MMW. 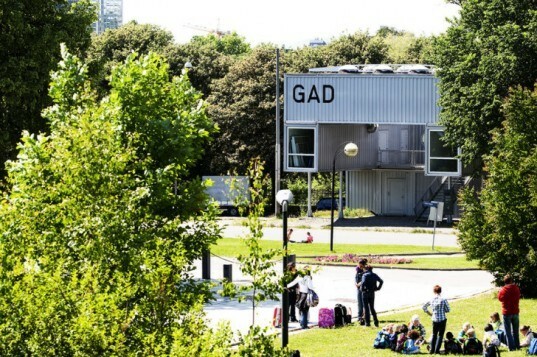 Called GAD, the structure was conceived as a semi-temporary art gallery that could easily be disassembled, moved and reassembled in just a few days. Originally placed in Oslo, Norway, GAD is a durable building that provides a ton of space for art exhibitions and outdoor events. 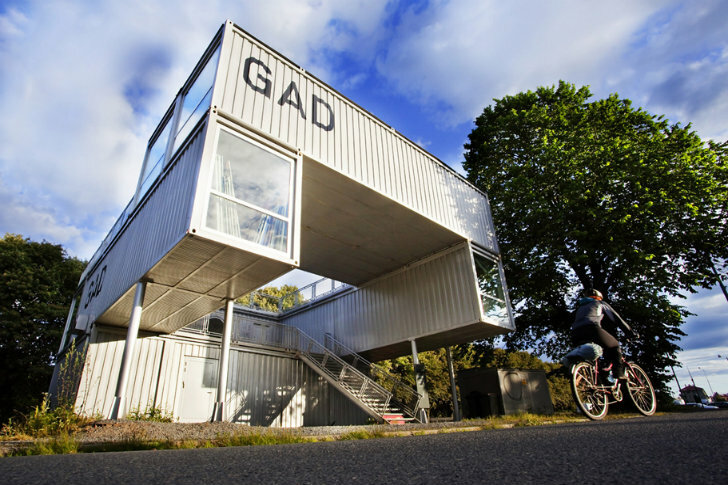 GAD was built from ten normal shipping containers by MMW architects for a client who wanted a semi-temporary gallery space that could be moved to different locations. The whole project can be disassembled, moved and then reassembled in just a matter of days. The ground floor is formed from five, 20′ containers set next to one another and is used to create a solid foundation for the next two floors. The second floor is made up of three, 40′ containers set in a U-shape with the ends cantilevered off the ground floor. Finally the third floor is made up of two, 40′ containers set out on the end and provides access to the rooftop terrace. Industrial staircases, posts and railings complete the design and provide circulation throughout the building. Each container is insulated on the inside, covered with sheets of plywood and sheetrock (GWB) and painted all white to give a good surface for showing artwork. The ends of the containers feature floor-to-ceiling glass windows, round porthole windows and some feature round skylights to infiltrate the space with natural daylight. GAD is built from ten normal shipping containers by MMW architects for a client who wanted a semi-temporary gallery space that could be moved to different locations. The whole project can be disassembled, moved and then reassembled in just a matter of days. The ground floor is formed from five, 20' containers set next to one another and is used to create a solid foundation for the next two floors. The second floor is made up of three, 40' containers set in a U-shape with the ends cantilevered off the ground floor. Finally the third floor is made up of two, 40' containers set out on the end and provides access to the rooftop terrace. Industrial staircases, posts and railings complete the design and provide circulation throughout the building. Each container is insulated on the inside, covered with sheets of plywood and sheetrock (GWB) and all painted white to give a good surface for showing artwork. The ends of the containers feature floor-to-ceiling glass windows, round porthole windows and some feature round skylights to infiltrate the space with natural daylight. Interior of ground floor gallery. Interior of the top gallery.